The 13-year-old male has zipped off rather abruptly from his feeding waters off Russia’s Sakhalin Island and sped across the Sea of Okhotsk to the west side of the Kamchatka Peninsula. Meanwhile, all this is being seen via satellite at Oregon State University’s Hatfield Marine Science Center in Newport. He’s called “Flex” by the scientists, and he’s just one of 130 western grays remaining in what is one of the world’s most endangered whale populations. Scientists from Bruce Mate’s Marine Mammal Institute are surprised by his movements, and they’re allowing the public to get in on the action via a map that is updated weekly at http://mmi.oregonstate.edu/Sakhalin2010. “We’re making guesses as to where ‘Flex’ will now head, but they’re just guesses because western gray whales have never been tagged before and we do not know where they breed and calve in the winter,” said Bruce Mate, director of OSU’s Marine Mammal Institute and a principal investigator on the project. Mate said it would fairly unexpected to see Flex wander off to Baja, as western whales are considered genetically distinct from their much more common eastern North Pacific cousins. Mate has been a pioneer in the satellite tracking of marine mammals, and has led this study in collaboration with Russian scientists, which included the tagging of Flex. Western grays were decimated by whaling in previous centuries and the whales were feared to be extinct in the mid-1970s. But a population was rediscovered off Sakhalin Island and has been monitored since the mid-1990s. 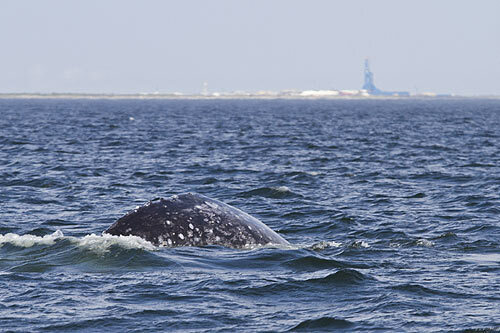 Sakhalin Island is the site of major offshore oil and gas activities and efforts are under way to minimize the impacts of industrial development on the whales, which also face threats from accidental entanglement in fishing gear. Five female western gray whales have died accidentally via entanglement over the past four years. After getting tagged, Flex lingered off the Sakhalin Island area to munch on the local cuisine of the sea there. Mate believes his recent departure may be due to weather, as the ocean in this area will soon ice over. Flex was first seen as a calf in 1997 and has been observed on a regular basis during summers since that time. But this is the first time a whale from this critically endangered population has been tagged and followed by satellite. Scientists had hoped to tag a dozen whales during the month-long expedition in the fall, but poor weather conditions and treacherous seas made even finding and approaching the whales difficult. They finally were able to tag Flex on the last day of their voyage and have been tracking him since. “We’re keeping our fingers crossed,” Mate said. “This particular tag stays attached an average of about three months on gray whales. Western grays are bottom feeders and the tag can easily get scraped off while feeding, or during contact with other whales during mating.